The decision by US President Donald Trump to remove the US from the Paris Agreement on climate change was met with both derision and applause. Such is climate politics in the United States in the 21st century. This talk focuses on climate politics as “Manichean paranoia,” a term used by the late US statesman Zbigniew Brzezinski to describe an worldview in which your opponent is considered to be malign and willfully ignorant, whereas your own side is noble and uniquely enlightened. 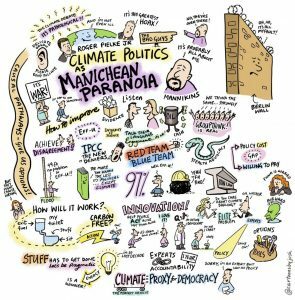 While the two sides of the contemporary US climate debate disagree on many things, they are firmly united in their Manichean paranoia. I will describe this pathological approach to climate politics and why it matters. There are alternatives, and I’ll recommend five specific actions to improve political debate over climate. Changing climate politics won’t be easy and isn’t possible without a demand for change. The shared commitment to partisan battle between otherwise dueling camps of the climate debate is deeply held, and the siren calls to join the ranks on one side or the other is difficult to resist. However, rethinking climate politics should matter — not just for those who care about climate policy, but more generally for achieving the broadly shared goals of economic growth and the sustainability of liberal democracy.